Three years ago, Yue’s mother was diagnosed with Type 2 Diabetes. From that time, Yue has noticed how much pain it has caused her mother and how it has affected her day-to-day lifestyle. We are shocked by the number of people suffering from Type 2 Diabetes (T2D). The number of people with diabetes has risen from 108 million in 1980 to 422 million in 2014, T2D patients comprise more than 90% and an estimated 1.6 million deaths were directly caused by diabetes in 2015, which was reported by World Health Organization. Therefore, we created Brimly. It is a mobile app that helps people who are suffering from T2D effectively and efficiently choose food when grocery shopping. The computer vision technology enables users to quickly identify diabetic-friendly food. 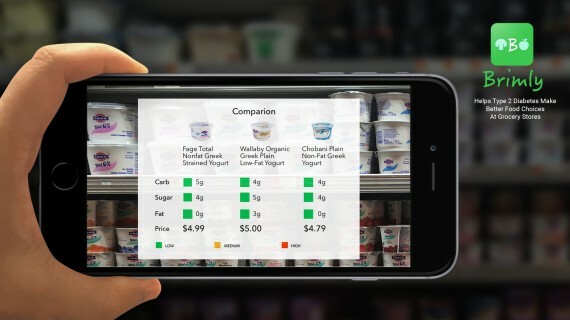 Through augmented reality, T2D patients can quickly explore key nutritional facts and easily compare multiple products at the same time to meet their personal needs. Amidst a rapid growth of food products and trends, Brimly can empower diabetics to make food choices in a refreshing way and embrace new and different foods.